Organisers of the first-ever Sky Ride event in Leeds are calling on those taking part to turn the city centre into a sea of yellow next week. From 10am to 4pm on Sunday 7 July, riders will be able to take advantage of traffic-free streets as they take part in a free city ride hosted by Leeds City Council, Sky, British Cycling and West Yorkshire Metro’s go:cycling project. As the event forms part of the one year to go celebrations to Leeds hosting the Grand Départ of the Tour de France, the organisers are calling on as many people as possible attending to dress in the race leader’s iconic yellow to help mark the occasion. The spirit of Le Tour will form a major theme of Sky Ride, with a range of street entertainment and activities happening around the full 5.2-kilometre route. There will be major ‘activation’ zones at the startline on Victoria Gardens and Woodhouse Moor, as well as activities hosted by the University of Leeds where the route passes through the campus. Some of the sights and sounds of the Tour de France will also be prominent, with the approach to Woodhouse Moor being turned into a ‘fan zone’ featuring some of Le Tour’s famous temporary road markings encouraging the riders on. The spirit of the fanatical supporters on the legendary slopes of the Alps and the Pyrenees will also be seen with the colour of national flags and banners as well as heard with cow bells, drums and horns. Pop star and Sky Ride Leeds Ambassador Kimberley Walsh will be on hand helping to start the event from Victoria Gardens, which will also be the first ‘activation zone’ featuring a range of cycling stalls and activities including free bike decorations, a Wattbike challenge, Team Sky Area, bike maintenance, cycling information and advice from British Cycling, a bike café and a big screen relaying images from the Tour de France. Free bike hire including adapted cycles will also be available, while Victoria Gardens will also host a special winners’ podium for participants to have their photo taken in front of the iconic Arc de Triomphe backdrop complete with flowers and cuddly lion echoing the winner’s experience of the world’s greatest cycle race. With the full route at 5.2km, riders will be able to start at any point around the course and also at any time throughout the event, covering as much distance or as many laps as they wish. Aside from the full route, there will also be a shorter 500 metre loop on offer around Victoria Gardens and a 750m route at Woodhouse Moor, which is the second of the ‘activation zones’. This zone will feature regular BMX displays by riders from The Works Skate Park, free bike maintenance, virtual bike racing simulator, go:ride skills circuit, Breeze inflatables and information on cycling. The final element of the full route takes riders through the campus of the University of Leeds, where a special marquee will feature a range of refreshments including bike smoothies plus a bike simulator challenge, while staff from the university’s state-of-the-art sports facility The Edge will also be on hand offering free health and fitness checks. Sky Ride Leeds is part of a new agreement between Leeds City Council, West Yorkshire Metro and British Cycling to help promote and develop cycling in the city and wider region. Aside from the mass-participation city centre event, there are also a range of Sky Ride Local rides available, including those for women-only. These rides are led by a British Cycling-trained Ride Leader, and give participants the chance to get out and explore their local area also as improve their cycling ability. “Sky Ride Leeds is a fantastic opportunity for people in the city to dust off their bikes and take to the streets on two wheels. The range of entertainment will make for a great family day out and the route is perfect for all ages and abilities. Organisers are also looking for volunteers to help with the running of Sky Ride on Sunday 7 July. Please contact Stacey.walton@leeds.gov.uk or call 0113 224 3406 for more information or to register. 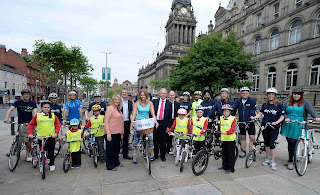 About Sky RideSky Ride Leeds is one of sixteen Sky Ride city events taking place across the UK this summer on traffic-free streets, enabling cyclists to enjoy a day of bike-based entertainment and to explore their city on two wheels with family and friends. The free events aim to encourage thousands of people, of all ages and abilities, to get on their bikes. Sky Ride Local rides are free small, weekly community bikes rides that give participants the chance to get out and explore their local area. Led by a British Cycling trained leader, who is on hand to provide support and tips on how to improve for people of any age or ability they will be taking place across the country this summer. In 2012 Sixteen Sky Ride City events and 1,000 Sky Ride Local rides which saw over 146,000 participants take part in Sky Ride City events and over 17,000 participants take part in Sky Ride Locals. Last year British Cycling and Sky beat their goal of getting one million more Britons on their bikes and cycling regularly (once a month) by 2013. About British CyclingBritish Cycling is the national governing body for cycling as recognised by the UCI - the international federation for the sport. Based in Manchester at the National Cycling Centre, British Cycling works across all levels and six disciplines of the sport, from providing the support and encouragement people need to get riding their bikes for the first time, to being home to the hugely successful Great Britain Cycling Team. Continued success at the highest level is inspiring a boom in participation across the nation. There have never been more opportunities to ride a bike, be it for fun or sport, and British Cycling is at the heart of this growth. British Cycling also works hard to represent cyclists' interests at all levels, including campaigning on important issues including road safety. As a membership organisation, British Cycling provides a suite of benefits and support to its members who currently number over 70,000. All membership revenue is invested back into cycling. About Sky in LeedsSky is a leading employer in Leeds which has grown fourfold since 2006 and now employs over 1,200 people in jobs ranging from IT and marketing to customer service and journalism. About SkySky is the UK and Ireland’s leading home entertainment and Communications Company. Around 40% of all homes have a direct relationship with Sky through its range of TV, broadband and home telephony services. Sky is the UK’s biggest investor in television content, investing more than £2.3 billion a year in channels such as Sky 1, Sky Atlantic, Sky Living, Sky Arts, Sky Sports, Sky Movies and Sky News. Around two-thirds of Sky’s content spend is invested in the UK and Sky is the fastest-growing source of investment in original British programmes. More than 30 million people watch Sky content each week. Alongside its commitment to offering customers a greater choice of high-quality content, Sky is a leading innovator. Customers enjoy total control and flexibility over their favourite TV through Sky+, watch TV on the move through Sky Go, and enjoy the best quality TV experience at home through High Definition and 3D. Sky distributes its content broadly over several platforms, including satellite, cable, IPTV, mobile and WiFi. NOW TV, Sky’s second consumer brand, builds on the company’s leadership in internet TV. Sky is also the UK's fastest-growing home communications company and favourite ‘triple-play’ provider of TV, broadband and home phone. Sky believes in making a wider contribution to the communities in which it operates by taking positive action on the environment, supporting grassroots sport, opening up the arts to more people and raising the aspiration of young people in schools. Sky employs 23,500 people, has annual revenues of £6.8 billion and is estimated to support a £5.4 billion contribution to UK GDP. Sky is listed on the London Stock Exchange (BSY).